LNS Research has blogged several times on the Open Process Automation Forum and why we thought the initiative was important enough that not only end users should get involved, but decided to commit to joining the Open Group and become engaged with the effort. Not only are we observers, but we are actively participating in the Business Case Working Group and using our experience with other efforts to standardize elements of the process control architecture stack. This will help to frame the discussion around what are the likely outcomes of the effort. By understanding potential outcomes, it is possible to look at the forces that will either support or inhibit those outcomes. One tool that is useful in depicting the outcomes is the use of a 2x2 decision matrix. This allows two simultaneous variables to be mapped against each other and aids in visualizing a sometimes-complex problem, in a simpler form. Is an inclusive collaboration between users and suppliers to provide the framework for an open systems architecture innovation and value creation." 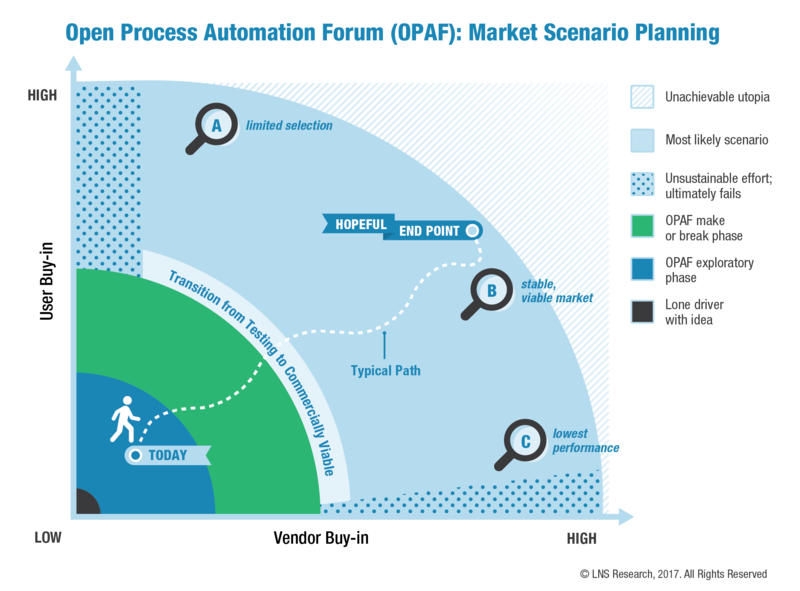 Using the two axis of user and vendor buy-in, LNS has modeled the market evolution from its beginnings where ExxonMobil introduced the idea of an open process automation approach to control system delivery (lower left low-low point). Fortunately, we are past that point today with the Open Group forum activities, but this is where the initiative started 24 or so months ago. Today we are slightly up and to the right in the exploratory phase where the initiative is organizing, setting objectives, and defining desired outcomes and potential paths to get there. Many vendors are expressing interest, listening, and trying to figure out the implications but are willing to participate in this activity. End-user awareness is going up, but there is uncertainty as to the benefits and the practicality of it all. The make-or-break phase is next and will occur over the next 24 months; the phase where users and vendors either get on board to drive success or we end up with unsustainable outcomes. There are two potential scenarios where an unsustainable outcome could emerge. This is failure; either users get on board, but the vendor community abandons the effort, so no products get built, or vendors offer products, but they are priced so high or they have such limited functionality that users won’t buy them and the market stalls out. This is what happened with a standardized data communications effort in the 1980’s known as the Manufacturing Automation Protocol (MAP) initiative. Assuming that a market begins to evolve it will move from the pilot or testing phase to commercial viability as long as there are enough vendors and users supporting the initiative. At the full upper right (high-high) corner is a buyers utopia, which LNS believes is unachievable. It represents the universal adoption of essentially only open process automation solutions with all vendors supply conformant technology. Thankfully, although I labeled this point as “unachievable utopia,” there is no hard delineation between this region and the most likely (hopeful) outcome. A: If only a few vendors offer OPA-compliant products, but the majority of users support them means there will be a limited selection in the market. The products will likely be software-defined and not very different from the vendors standard offering, and the ability to build an entire control system from only OPA-compliant products limited to process plants without extreme control scenarios. B: This region reflects a stable and viable market with a good percentage of the vendors delivering OPA-compliant products and many users demanding them. It represents a market where OPA products do not necessarily command a purchase premium. It is sort of like the SP50 Fieldbus market today. Lots of products which are mostly interoperable and no premium charged for the capability. C: If only a few users are willing to buy the products, but most vendors make them, it implies the product set will likely have lowest-common-denominator performance, be moderately expensive, and OPA will be judged as viable but will only be for complex plants that can justify the expense. The OPA capabilities might end up being software-defined. So, over time there will be the tendency to gain user buy-in as products prove themselves in the market, moving the market more towards the “B” region. The challenge in navigating from where the OPA effort is today through a viable market kickoff to an end state that is sustainable over the long term recognizes that the path will not be a straight line. The path will wander as shown symbolically in the diagram. The key to success for the Forum members will be the ability to recognize what direction the market is heading and to make corrective actions that keep it moving towards state B if it starts to deviate too far one way or another. The trick will be to avoid stalling the effort in the transition zone and trying to get the entry point into the blue zone as closely aligned to a trajectory that results in a stable market as practical. In a future post, we will look at the forces that are going to drive end-user and vendor adoption as the Business Case Working Group identifies the key value propositions for both of the groups.